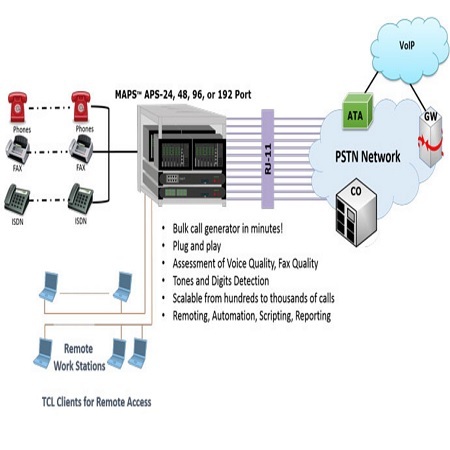 MAPS™ APS is the high capacity Analog 2-wire Bulk Call Generator used to test a Central Office (CO), PBX, ATAs, Gateway or other telecommunications equipment, which provide local loop interfaces. It includes a compact system comprising of MAPS™ APS, Analog Interfaces, Patch Panels and other optional modules (Fax Emulation and VQT Analysis) in a rackmount system. MAPS™ APS system supports up to 96 independent FXO ports per 1U MAPS™ APS Server and APSCB-48. More can be achieved by simply scaling the system with a 4U MAPS™ APS Server sporting 2 Octal T1E1 Cards which can then support up to 384 analog ports.